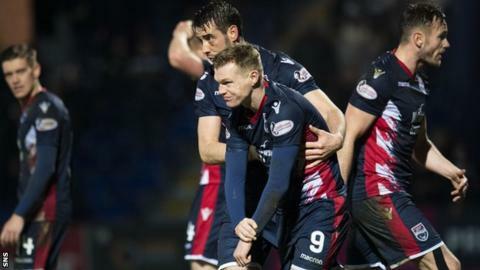 Billy Mckay suffered a suspected broken arm as he completed a hat-trick that gave Ross County a thrilling win over Ayr United to maintain their Championship lead. He pounced on to Jamie Lindsay's high ball into the box, but Lawrence Shankland levelled with a fine finish after the break. Mckay fired into the top corner before Andy Murdoch's header levelled again. The County striker finished well from close range to secure the win. But he fell awkwardly and was immediately substituted. County remain five points clear at the top of the table, while Ayr drop to third, three points behind Dundee United, who beat Inverness Caledonian Thistle 1-0. Ross County co-manager Steven Ferguson: "They are willing to stand up and be counted week in, week out and tonight was another example of that. "Obviously all our thoughts are with making sure Billy is okay - it looks like he has broken his arm, it has snapped, it looks a very sore one - but the three goals he scored just sums up his season, he has been absolutely fantastic for us. "We believe in our squad and we believe in the numbers we have, so we will dust ourselves down after this battle and make sure we are ready to go for our next game against Morton." Ayr United manager Ian McCall: "I'm unbelievably proud of them. We are up at the top of this league and we are playing against teams who are maybe better suited to it. "I thought we merited a draw, but we didn't get it, so we just take our medicine and get home. "This league is amazing. If you win three or fouor games in a row, everything can change and that is what we will be aiming to do." Goal! Ross County 3, Ayr United 2. Billy Mckay (Ross County) right footed shot from the centre of the box to the bottom left corner following a set piece situation. Goal! Ross County 2, Ayr United 2. Andy Murdoch (Ayr United) header from very close range to the bottom right corner.